This delightful Herb Mixture has been Hand Blended by ~Moon Goddess Garden~ to Include Herbs known for their Connection with Wealth and Prosperity. It has been placed in a small Potion Bottle measuring approx 3" (7.5cm) in height. It can be used in all Spell work and Sachets, Rituals, Blessings and Incense mixes. 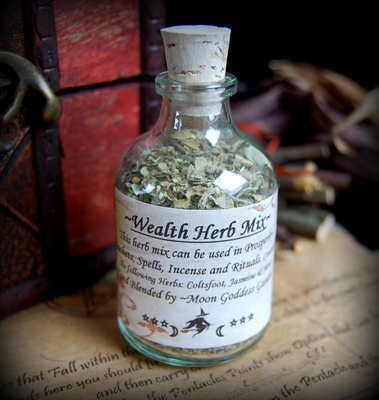 This Wealth Mix Potion Bottle measures approx 3" in Height and would make a delightful addition to your Wiccan items!